Red highlights are fiery, dramatic, and fun! Infuse some serious sass and pizzazz into your everyday look - streak your mane with red hair highlights! Don't be fooled into thinking this is a style reserved solely for rock stars and teens; the most subtle addition of color can make an understated difference. 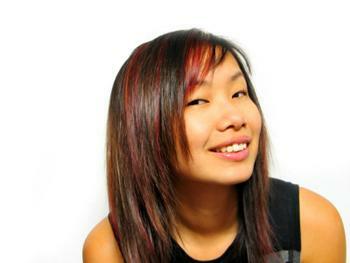 Adding red highlights to your hair can either be a complete change or an update to an already similar look. Whether you're looking to achieve something dramatic and eye-catching or just slightly bolder than your current style, you can rest assured that a little red will easily do the trick. This color is fiery and passionate but can be equally soft, rich and glamorous depending on the shade you choose. Achieving red highlights is as simple as a quick do-it-yourself job in the comfort of your own bathroom or a trip to the hair salon. If you enlist the assistance of a hairdresser, you'll have plenty of help selecting the red that's right for you. Hair color charts, swatches, and videotapes are just some of the resources available that make the process just a bit easier. This is especially helpful if you're new to the world of hair color or are especially indecisive. Adding highlights at home is also a simple, painless process. There are a number of products available that promise vibrant color, a long-lasting result, and a beautiful finish. Jerome Russell's Temporary Spray-In Natural Color Highlights does a flawless job adding color specifically to those areas that you want to highlight with just a quick spray. Available in a variety of red-toned shades, including Brick Red (a sharp, true red), Rich Rose (a warm, feminine rosy-red), and Warm Copper (a natural, glistening rusty-red), the spray rinses out easily. A drawback is the slight mess it can create; use plastic application gloves if you're wary of cleaning out your tub. Everything you need to achieve natural highlights is included in Garnier's Color Breaks kit. Simply mix the lightening powder with the cream developer and use the applicator brush to apply several "breaks" (stripes) of color to the preferred areas. Rinse after 20 minutes and enjoy a refreshed and bold look! Choose the "light auburn to reddish brown" box for warm, coppery highlights that just touch on red. Chunking doesn't sound glamorous, but the results of L'Oreal's Chunking Blocks of Highlights sure are! This red is intense and guaranteed to produce the kind of vibrant results that will grab the spotlight whenever you walk in the room. The chunky effect means your highlights will be thick and blocky - and you'll achieve salon-quality results without the added expense. The beauty of Easilites' Human Hair Clip-In Highlights is that no one needs to know they're not real. Red Hots is a shocking jolt of red that blends into your natural hair with a simple snap of the one inch clip. This hair can be personalized it to really make it your own; run a curling iron or flat iron through it for the look you love. You can even perm it! If you'd rather venture to the salon for your red hair highlights, consider Paul Mitchell's exclusive Inkworks formula which produces pure, brilliant color in a variety of eye-popping shades. The Neon Red and Red hues offer you a couple of options -- one is intense, while the other is a bit more down to earth. Ask your stylist to run the product through your hair for a naturally highlighted finish. Red hair color fades faster than any other dye. Experts recommend selecting a red with a brownish undertone to make the color last longer. Red hair color molecules tend not to penetrate blonde hair very well; thus, it's difficult for a blonde to pull off an exceptionally deep red shade. Strawberry tones are more easily achieved. Red highlights are high maintenance! Expect to deal with rapid color fading. Put up a strong battle by using color-protective shampoos and conditioners, and don't wash your hair everyday. Red hair highlights are stunning and glamorous, as well as easy for anyone to achieve. Find the right red shade for your next bold look and don't be afraid to try out some spectacular new highlights.